To tell when it is time to change out the activated carbon bed in your liquid or vapor phase adsorption vessel, a variation in the color of the effluent is always a good indication; strong odors are another. In the case of vapor phase applications, a carbon breakthrough detector may help sound the alarm; however, proper analytical testing of the effluent is the best method. Once you determine your activated carbon is near spent, TIGG’s Activated Carbon Exchange Services can help you cut through the regulatory red-tape and keep your adsorption system up and running. Our experienced, technical sales reps will help mitigate the hassle of completing the required paperwork and assist in meeting regulatory guidelines during activated carbon change outs, vessel exchanges, or disposals. Whether you want to change out your spent activated carbon on site, or swap depleted vessels with freshly-filled ones, TIGG’s nation-wide network of Certified Activated Carbon Exchange pros have got you covered. Our 40-hour OSHA HAZWOPER-certified carbon change out professionals not only exchange your spent carbon, they will also inspect your vessels and make minor repairs if necessary. 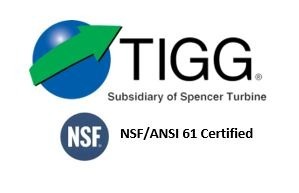 TIGG offers one of the most extensive lines of bulk granular activated carbon filter media and vessels in the industry for both liquid phase and vapor phase applications. TIGG also has a large, in-stock inventory of activated carbon equipment available for sale or ready to rent. If you have an air or water stream with multi-component contaminants, TIGG can help size the vessel required or estimate the amount of activated carbon needed a daily or yearly basis with our predictive model.